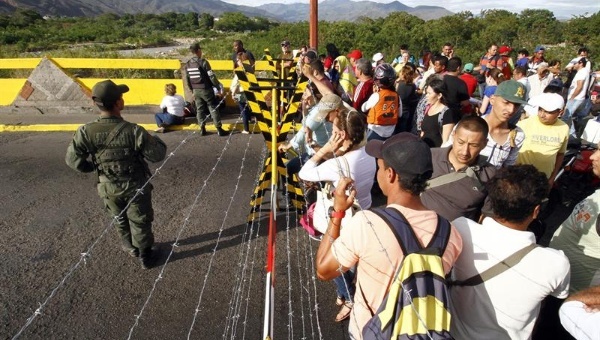 IPIALES, Colombia: Dozens of furious Venezuelan migrants fleeing economic misery in Venezuela for a new life elsewhere on Sunday defied rules requiring they hold a valid passport to cross the border from Colombia into Ecuador, and authorities appeared to be allowing it. Hundreds of desperate people who traveled days from Venezuela, mostly by bus but some on foot, were prevented from passing the checkpoint near the southwestern town of Ipiales by a regulation set by Ecuador’s President Lenin Moreno that kicked in on Saturday. “We have no money, we need to move on now and get our lives back,” said Mayerly Isaguirre, out of breath from dragging her belongings up the steep hill at the Ecuadorian border. The primary school teacher, 37, was traveling with her boyfriend and had planned to cross legally with her Venezuelan national ID card en route to find work in Peru, where other family members successfully arrived weeks ago. But they were stopped by the new regulation. “They haven’t told us anything – we are just waiting around like idiots,” she said, wheeling her fuchsia colored suitcase across the open check point as guards looked on. Peru’s government announced immigration measures similar to Ecuador’s on Friday, with passport requirements for Venezuelans beginning on August 25. Ecuador on Sunday said children and adolescents traveling with their parents could cross without passports. Ecuador’s foreign and interior ministries declined to comment. A spokesman for Colombia’s migration office could not immediately be reached for comment. Over the last two years, especially, many Venezuelans have struggled to obtain passports amid the OPEC nation’s political and economic chaos. Many like Jorge Luis Torrealba, who traveled with 12 friends and family members, including two small children, were unable to find space in the tents and were sleeping on the freezing concrete pavement. “We are from the Caribbean, we can’t handle this cold,” he said, shivering despite wearing four t-shirts, two sweaters, two pairs of socks and two pairs of jeans.